Sarah Read is a dark fiction writer in the frozen north of Wisconsin. 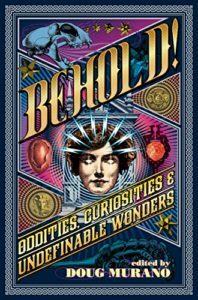 Her short stories can be found in Gamut, Black Static, and other places, and in various anthologies including Suspended in Dusk, BEHOLD! Oddities Curiosities and Undefinable Wonders, and The Best Horror of the Year vol 10. Her novel The Bone Weaver’s Orchard is now out from Trepidatio Publishing, and her debut collection will follow in late 2019. 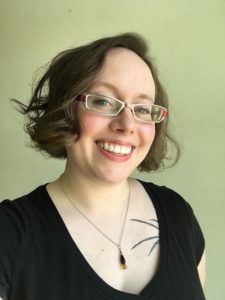 She is the Editor-in-Chief of Pantheon Magazine and of their associated anthologies, including Gorgon: Stories of Emergence. She is an active member of the Horror Writers Association. When she’s not staring into the abyss, she knits. Reach her online at www.inkwellmonster.wordpress.com or on Twitter @inkwellmonster. So, what do new readers need to know about Sarah Read? Hello! I’m a library creature and dark fiction writer–mostly gothic, sometimes gory, often whimsical. The stories, I mean. Well, and me. I live in a northerly frozen place with a husband, two sons, two cats, and many hundreds of spiders. I write everything by hand. When I’m not writing, I’m going for walks or knitting, or both. What was the inspiration behind The Bone Weaver’s Orchard? I’ve always loved gothic stories with big spooky houses, secret passages, and uncanny characters. The Secret Garden by Francis Hodgson Burnett is the main inspiration behind the book. With a bit of Guillermo del Toro thrown in for some wholesome horror. I wanted to write horror that would appeal to both teens and adults–with stakes and tension that both could relate to, without pulling the punches for teens, who I believe are better equipped to handle horror than adults are. Any strong feelings about Lovecraftian fiction? I confess, it’s not my favorite flavor of horror. I prefer gothic, ghosties, and gore to tentacles and elder gods. I like broken hearts with my madness. But I do love a creeping dread, and Lovecraftian horror does that well. I enjoy the newer takes more than Lovecraft’s originals, though. I believe his works have inspired writers far greater than he ever was. I love Charles Dickens and Wilkie Collins and the Brontes, for the classics. For modern influences, I grew up on a steady diet of Datlow/Windling anthologies. I’ve loved Anne Rice since I was ten years old and remain a devoted fan. As for recent favorites, I adore Stephen Graham Jones, Paul Tremblay, Josh Malerman, Gemma Files, Helen Marshall, and OF COURSE Angela Slatter. <3 I was very lucky to have several kind and supportive librarians in my life who made sure I never lacked for good spec fic. More direct practical influence comes from the amazing community of authors who teach and support new writers. I can’t even begin to list them all, but I owe a huge debt of gratitude to Richard Thomas, Danielle Kaheaku, Rena Mason, Josh Malerman, Gemma Files, Bracken MacLeod, Alec Shane, Jack Ketchum (RIP, Dallas), and the folks at LitReactor. What over-used horror trope would you ban, if you were Queen of the Universe? Any trope that requires a woman as a plot device for the character development of a man, particularly if she’s a corpse or a memory, or some other faceless prop. It’s not just sexist, it’s lazy. Humans! Ugh, they’re the worst. More specifically, I’m terrified of global warming, food shortages, war, and the things I’ll have to do to protect my children as we face our inevitable extinction. Also, germs. Ick. I can’t, but only because I don’t remember a time when I didn’t want to be a writer! But I experience that feeling freshly on at least a weekly basis. Name six people, living, dead, fictional or real, that you’d invite to a dinner party ?and why would they make the guest list? Geoffrey Chaucer, Grace O’Malley, Dream of the Endless, Baba Yaga, Jo March, and Falkor. I think we’d have pretty much everything we’d need, then, for a proper party–and the means to silence the witnesses. The menu might get awkward, though, so the seating arrangements will have to be made carefully. Tanith Lee or Charlotte Perkins Gilman? Explain your choice. Child me whispers, “Tanith Lee” while adult me whispers, “Charlotte Perkins Gilman”–both of us, in unison, one in each of your ears. Lee built amazing worlds that childhood me needed to hide in, and Gilman helps adult me live in the world as it is. What is next for Sarah Read? Happily, lots! 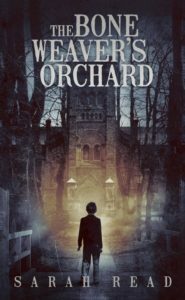 My debut novel, THE BONE WEAVER’S ORCHARD comes out from Trepidatio Publishing on Feb 1st. 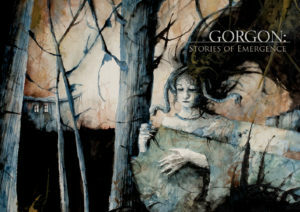 An anthology I edited called GORGON: STORIES OF EMERGENCE will be out shortly, containing 43 gorgeous contemporary myths of transformation. I have a few short story requests that I’m working on. And I’ve just signed a contract with Trepidatio for my debut fiction collection! It will be out before the end of the year. So, I’m keeping busy. Maybe too busy. But I can’t stop. Maybe next for Sarah is a nap, then all that other stuff. This entry was posted in Uncategorized and tagged and Falkor, angela slatter, baba yaga, Brontes, Charles Dickens, Charlotte Perkins Gilman, Dream of the Endless, ellen datlow, Francis Hodgson Burnett, Gemma Files, Geoffrey Chaucer, GORGON: STORIES OF EMERGENCE, Grace O'Malley, Guillermo del Toro, helen marshall, Jo March, Josh Malerman, Paul Tremblay, Sarah Read, Stephen Graham Jones, Tanith Lee, terri windling, THE BONE WEAVER'S ORCHARD, Trepidatio Publishing, Wilkie Collins. Bookmark the permalink.